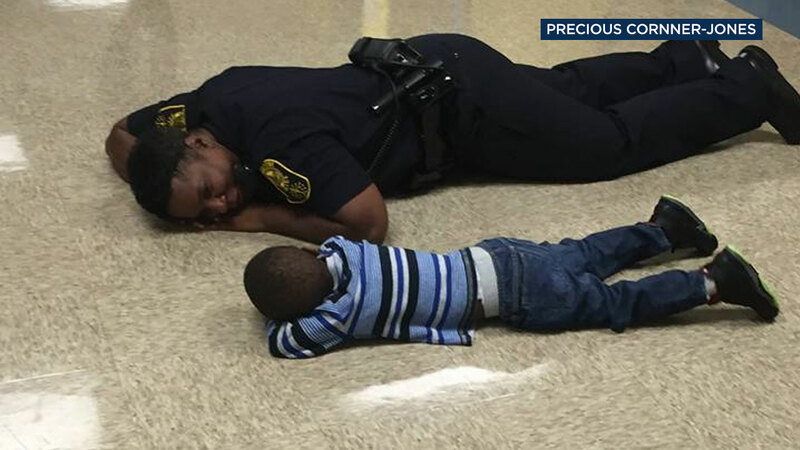 INDIANAPOLIS, IN -- An Indiana police officer got down to a 4-year-old's level -- literally -- when the little boy's case of the Mondays took a turn for the worse. Indiana State Police Officer Precious Cornner-Jones, 40, attended a high-five rally at Indianapolis Public School 88 on Monday to support her pastor, who leads the rallies in which members of the community give high-fives to students walking into school to brighten their days and give them inspiration, Cornner-Jones told ABC News. When the little boy came in, he had a "look" on his face so severe that Cornner-Jones could tell that he was not in a "good mood," she said. Upset, the boy just fell to the floor. Cornner-Jones, a mother herself to two young boys, ages 3 and 5, and a 17-year-old daughter, spotted the boy's mother from across the room and signaled to her that she would "deal with it," she said. Then, she handed her keys and phone to fellow church members and "got on the ground" next to him and "formed" her body in a similar position as his. "It wasn't a cop moment," she said. "It was a mother moment." At first, the boy looked at her in surprise, "Like, 'What are you doing?'" Cornner-Jones said. She wiped tears from his eyes and asked him, "Hey, little man, what's going?" and told him that everything was going to be okay, she said. "I understand these kids sometimes," she said. "They just need someone to get to their level." Cornner-Jones spent a few minutes on the floor with him, and before long, he was smirking at her, she said. It was a "spur-of-the-moment" interaction that she didn't think would garner media attention, but she's glad she was able to be part of something "positive," she said. Cornner-Jones never found out what the boy was upset about, but his mother thanked her multiple times before and after she walked him to his classroom, and the two shared a hug, Cornner-Jones said. "I think people lose sight that these kids are human too," said Cornner-Jones, who has been with the Indiana State Police since 2009. "They have bad days. We can't expect them to be little robots and have them do exactly what we say." Cornner-Jones' husband, Thaddeus, wasn't surprised by his wife's act of kindness, he wrote on Facebook, calling her his "queen." Cornner-Jones said she hopes the story teaches people to have "more patience" with kids and inspires people to "stop" for a moment and "show someone some love."